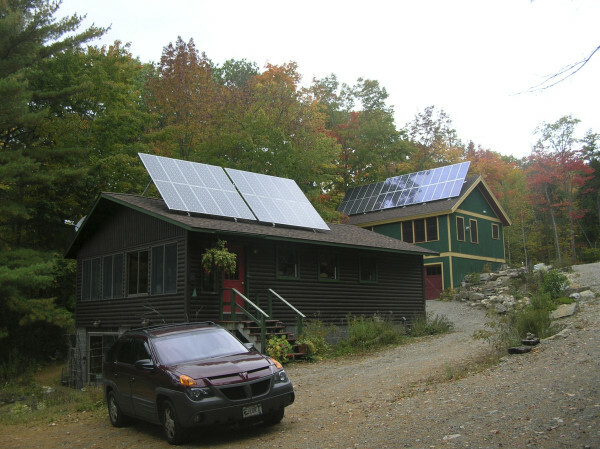 Two arrays of solar panels sit atop the buildings at Williams Pond Lodge in Bucksport in this 2008 file photo. When homeowners with rooftop solar panels generate more electricity than they need, they can sell that excess power back to the utility company. That has made installing solar power affordable for many Mainers. But other customers are footing part of the bill for those payments, and with solar power growing in popularity, regulators are concerned that’s not fair. The arrangement, called net metering, is now before the Maine Public Utilities Commission, which could dramatically change the rules or pass back to lawmakers a hot-button issue on political, economic and environmental fronts across the country. Gov. Paul LePage has proposed eliminating net metering in Maine. The outcome charts a course for the future of the power grid, which is expected to rely less on big power plants as part of a shift toward small-scale generation — solar, wind and electricity storage at homes and businesses. Solar customers can draw electricity from the grid when their panels don’t provide enough power, such as at night or during times of peak usage. When the panels produce more power than they need, customers get credits from the utility. Basically, they run their power meter in reverse when they generate more than they consume. Solar customers pay for the “net” amount of electricity they use for the month — or the power they draw from the grid minus the amount they sell back. When that figure is negative, customers get a credit that they can apply to future monthly bills, for up to 12 months. They do not get cash from the utility for excess power they generate. Net metering, also known as net energy billing, has helped solar grow because customers can recoup their initial investment on a solar installation, which can take 10 years or more, much faster. In Maine, there were about 2,000 residential net metering customers and 271 commercial customers at the end of 2015, according to U.S. Energy Information Administration estimates. Solar installers and hundreds offering public comment have pleaded with the commission not to dismantle net metering without an alternative, saying it would curb the growth of their business in Maine’s relatively small, but rapidly growing, solar market. Larger utilities such as Central Maine Power and Emera Maine were directed to flag down regulators when net metering customers reached 1 percent of peak demand, in order to re-evaluate the program. That review began earlier this year, with CMP declaring it hit the mark. Emera Maine has said it’s not far behind in its Bangor Hydro Electric district. That’s cleared the way for utilities, consumer advocates and others to fight over the future of decades-old net metering policies that a coalition of interests tried to replace during the last Legislature. The parties generally agreed net metering is not equipped to take on a longer-term shift to “distributed generation,” in which homes and small businesses produce energy on site. In the meantime, utilities and solar installers split sharply on the issue of what to do with net metering. Large solar installer SunRun requested further scrutiny of how CMP calculated getting to the 1 percent solar capacity trigger. Maine installer ReVision Energy also questioned whether that cap has actually been hit, estimating that only about 50 percent of the power its customers generate goes back onto the grid. The problem regulators and utilities see lies in how solar customers are paid for their power. When net metering customers need power from the grid, they pay the retail rate to the utility, just like any other customer. When they sell their excess power back to the grid, the utility pays them at that same rate. In other words, the price for the power coming to a net metered customer is the same as any power going out. That per-kilowatt retail price includes the cost of the electricity itself, separate costs for transmission and distribution, and even some lingering costs from the state’s deregulation of electricity markets in 2000 (which compensate utilities for power generation assets they were forced to sell). Net metering customers don’t bear any of those added costs, but they get compensated at a price that includes them. That’s partly a product of net metering’s age. It was created in the 1980s as a simple way to pay a small generator without requiring them to install a costly second meter. Power companies argue that as solar grows, the overly generous policy becomes more of a problem. When utilities buy electricity from power plants, it’s at a wholesale rate that doesn’t include the extra costs. So they’re paying more for electricity from net metered customers. Utilities claim that shifts the added system costs to the rest of their ratepayers. That’s how net metering customers affect everyone else’s power bill. Solar advocates counter that photovoltaic systems provide benefits — reducing need for transmission and distribution upgrades and environmental benefits — that also aren’t properly compensated by net metering. Those benefits, they argue, more than make up for the unclear shift in costs to other customers. On both sides, parties agree that the payment design can be refined. There are no good estimates on how much more non-solar customers pay specifically because of net metering, or how to factor in solar’s environmental and system-wide benefits. The small utility serving the island of Matinicus offers one example. Matinicus would have to raise rates for all customers by about 1 cent per kilowatt-hour if four customers of the small utility opted to use net metering, Maine’s public advocate, Tim Schneider, who represents utility customers, wrote of a recent analysis his office did with the Island Institute. That would add to bills that already can go as high as 74 cents per kilowatt-hour, according to the Island Institute, which is more than 10 times the current standard retail rate. Smaller, consumer-owned utilities, such as the one on Matinicus, can elect not to offer net metering, while the state’s largest utilities do not have a choice. Solar advocates believe that the added expense for other ratepayers is miniscule. Maine’s 2,000 solar net metering customers make up a small fraction of the overall customer base. Together, CMP and Emera have about 733,000 residential and small commercial customers. As net metering becomes more common and the market for solar power continues to grow, utilities and regulators remain uncertain whether customers without solar panels are at risk of getting a raw deal. Check back tomorrow, when we’ll explore how debate about net metering is playing out in Maine.